Sand Hollow Championship Golf Course Hole 1: The golf course starts with a wide-open and slightly downhill tee shot, which is nice as there are not too many of those on the front nine. The red bunkers around the green must be avoided (really, avoiding the bunkers is a must throughout the course due to the unusual local red dirt/sand that fills these traps). The green is multi-tiered and tough to putt. Sand Hollow Championship Golf Course Hole 4: This long par four requires to good shots to reach the green. There is desert on both sides of the fairway from tee to green and missing the green-side bunkers is key. Sand Hollow Championship Golf Course Hole 5: The "short" par four on the golf course can be driven if the wind is behind the golfer. Otherwise, there is plenty of room to hit the generous fairway. The green is undulating and almost bumpy in a Scottish sort of fashion, yielding many putts that may be "double-breakers" if too long. 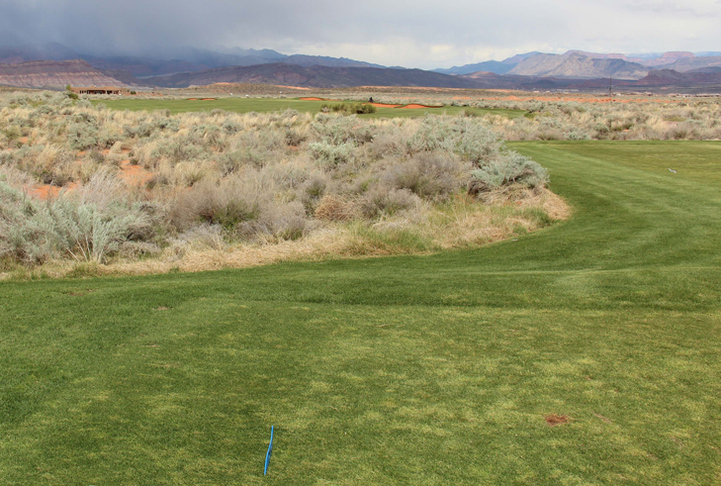 Sand Hollow Championship Golf Course Hole 6: This is a long, brutal dogleg left par four. 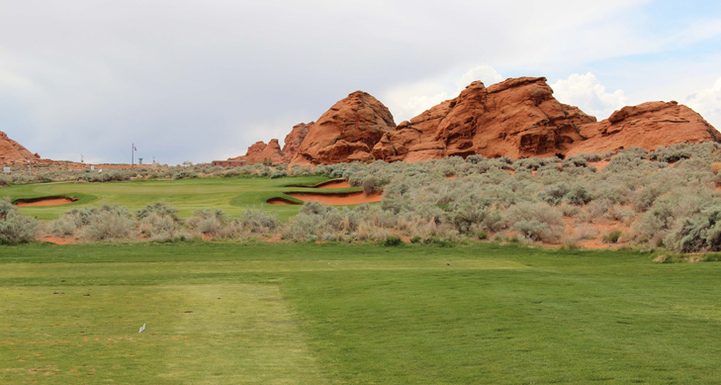 The tee shot is uphill and ideally will be hit towards the large red rock in the left-middle of the fairway. From there, the hole goes downhill towards the green, with large bunkers to the right of the putting surface and one short-left. 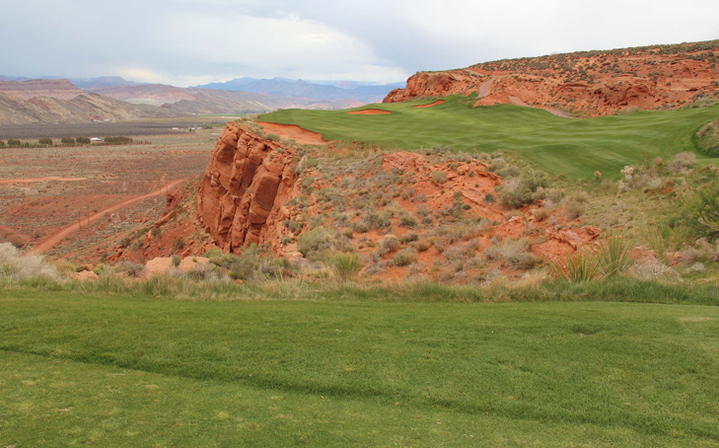 Sand Hollow Championship Golf Course Hole 7: The second par five on the course is long and slightly uphill. There is desert on both sides and quite a few bunkers to contend with along the way. The red rocks in the distance are a cool vista on many holes on the course, but here you head right towards them. 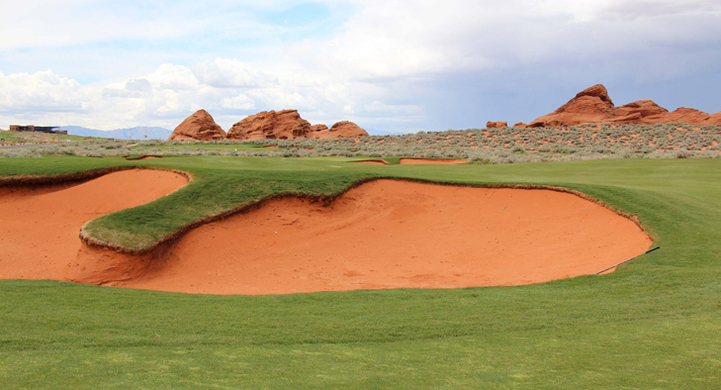 Sand Hollow Championship Golf Course Hole 8: There isn't much to this short par three, which offers a little breather on the otherwise long front nine, unless you find one of the deep bunkers around the green. The red rocks right of the green, however, frame the hole nicely. 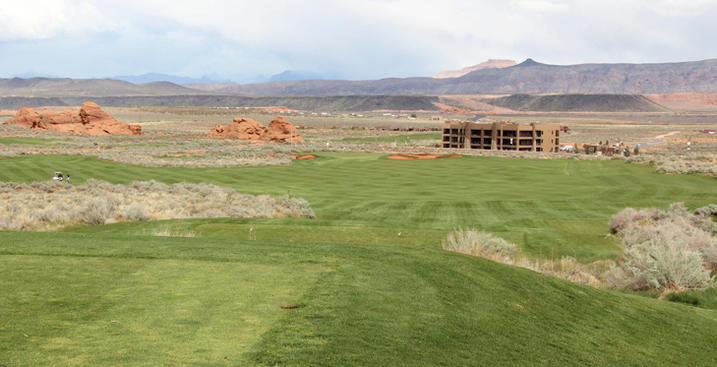 Sand Hollow Championship Golf Course Hole 10: The back nine starts with a downhill par five that is fairly wide open and will present a decent scoring chance if a solid drive is hit. Of course, finding the desert or any of the many bunkers will change those positive vibes into negative ones fairly quickly. Sand Hollow Championship Golf Course Hole 12: This amazingly unique par four challenges the golfer with a tee shot between two cliffs. The cliff to the left is straight down into oblivion, and the cliff to the right is in the form of a red rock wall that might throw an incoming shot in any number of directions. The hole is long and, after a downhill tee shot, back uphill to a green with deep bunkers in front and a tier separating its front half and back half. Sand Hollow Championship Golf Course Hole 13: The "little brother" to the previous golf hole, this one is much shorter and a little tighter, but the concept is the same: avoid going left or right at all costs. Sand Hollow Championship Golf Course Hole 14: Still playing along the cliff face to the left, the golfer may feel better as there is at least no cliff to the right. This hole, however, is very long, but downhill to a green that is perched out on the edge of the world. Going left is a bad thing from tee to green. Sand Hollow Championship Golf Course Hole 15: This par three has a lot of tee boxes, mainly I think because the location of the golf hole is so cool the designer wanted to let golfers try all of them. 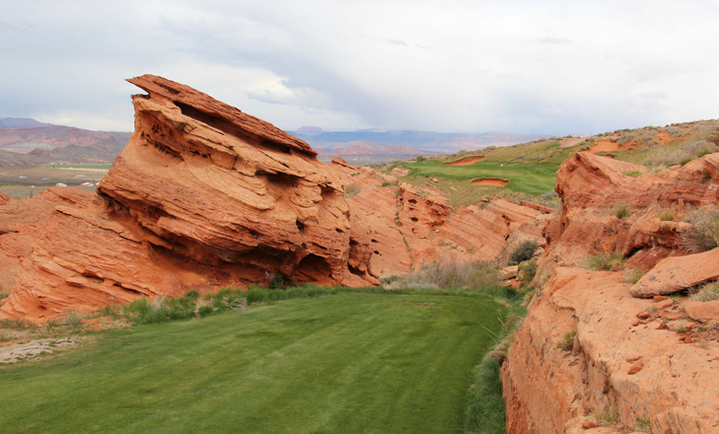 They range from elevated tee boxes with decent angles, to lower, longer ones shooting through red rocks and over the steep cliff face upon which the green resides. The hole itself is also really tough as shots to the right will find a steep hillside or bunkers cut into that hill, so the golfer must bring the "A game" to this hole to survive. Sand Hollow Championship Course Hole 17: The last par five presents a good scoring chance if the drive can flirt with the bunkers and desert on the left half of the fairway, as that will provide a relatively short shot at going for the green in two. Otherwise, the hole is short enough where it can be played conservatively and still allow for a short iron into the small, raised putting surface. 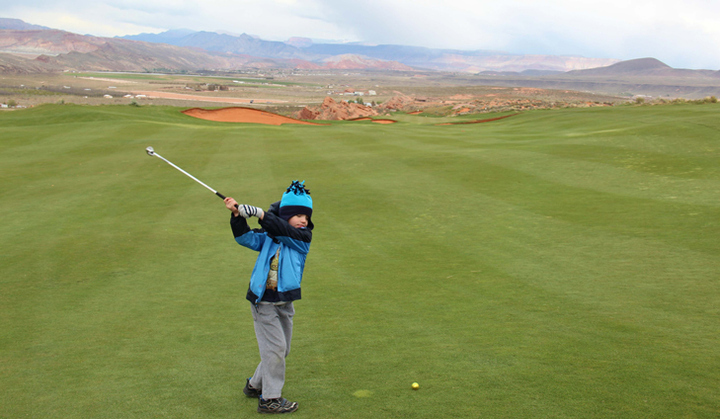 More Utah Golf Course Reviews.